Make that 8 Warlords at Giga-Bites! One can not speak the name warlord with out truly paying homage to the originals. That’s right! The tried and true Slaves to Darkness are back once again and with a vengeance. It was once described to me by a good friend that the Warriors of Chaos are the Globo Gym to everyone else’s Average Joes (Dodge Ball movie reference for those who haven’t seen it). The moto Globo Gym used was “We’re better than you, and we know it!”. Though Age of Sigmar has seen the rise of the individual armies of their respective chaos gods it’s time to worship them as they were meant to be worshiped... as a pantheon! As with most things involving the powers of Chaos an offering or sacrifice most be made to appease the gods. The massive amount of spikes protruding from every... single... model.... made sure the blood offering was made with the first slip of the finger. So a quick super glue band-aid and we were back in business. Though the models are older their craftsmanship is a hallmark Games Workshop diligence to the trade. With the ability to mix and match almost each aspect of each model I was able to make each model unique and amazing. Naturally I started with my knight units command. From there I began to really psyche myself up for the coming battles! As a former Empire player from Warhammer Fantasy I was always accustomed to having short end of the stick in a one on one fight, heck, even 3 on one would probably still leave me lacking. The tables have finally turned and now the chaos gods are on my side and I gotta say... it feels good to be bad for once. Here’s a close up of the 3 guys chosen to lead the unit. Some might be wondering, how does one doot a horn with a helmet on. I’ve come the conclusion the horn is demonic and doots itself. Lets single out the leader real quick while we’re here. It keeps getting better with these guys too. It seems the only way to beat a guy on a horse is to double down on the horse... so we did. I introduce to you (drum roll please). DOUBLE HORSE! Built for smashing the front lines and crushing what resistance remains the double hor.. sorry Chaos War Chariot is going to be a staple on the battlefield for me. Another beautiful model ready to route any cowards who would try to flee their wrath. Sorry guys I think we jumped the shark with double horse so I’ll try to hype up this guy as well. Though horseless the Chaos sorcerer will be an important piece in keeping your other units on the table. So in a way he helps keep the horses around which sorta makes up for his foot slogging ways. Prepare to see a horde of chaos knights imbued even further with the dark energy of theirs gods.. I hope everyone is ready to know true despair on the fields of glory because if there’s one thing each chaos god can agree to it’s that winning feels good and that’s what I plan to do. Let me know what ideas you guys might have for a color scheme. I’m trying to avoid looking like I would lean towards a specific god so avoiding the greens, purples/pinks, reds, and blues. Hope you guys get hyped a long with me. 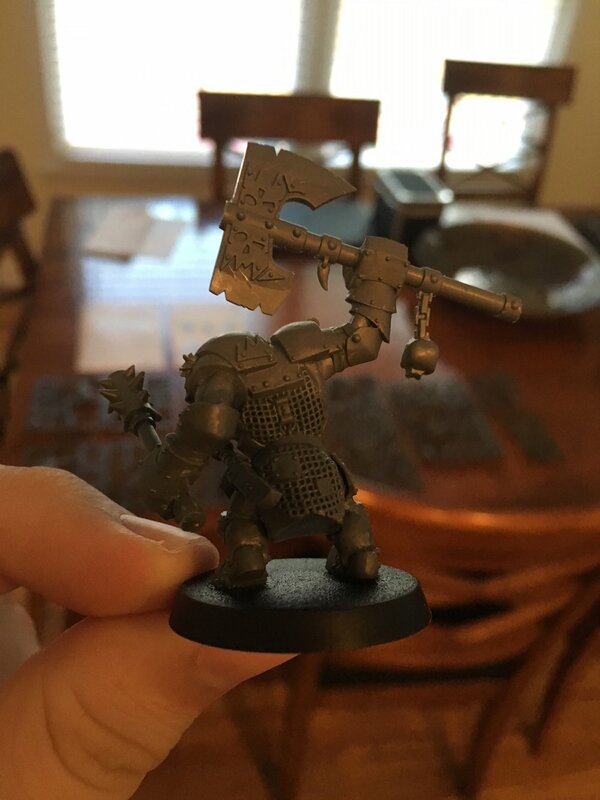 Age of Sigmar: Khorne Daemons! So David has gathered 7 of us together to build, paint and play a new AoS army. From the start I was excited to take part as I really enjoy the building, modifying, converting and painting process. Beyond that I have been looking for a way to get into AoS for a little while now, so this is the perfect opportunity! 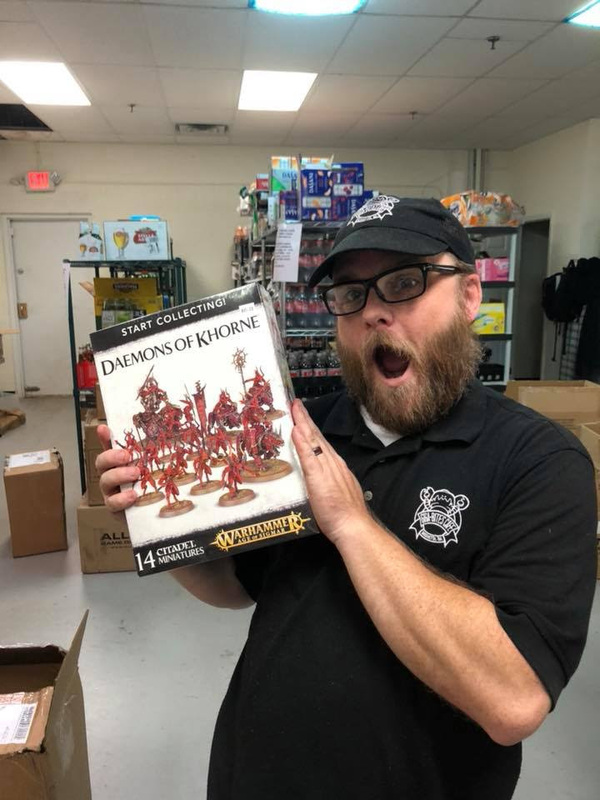 David rolled randomly for all involved and I received Khorne Daemons! I had my eye on a few armies when we started talking about this, and thankfully I ended up randomly getting one of the armies I was keen on! A more bone white directions, with burns on their legs (likely lava bases?) though I would change the head to the skull (maybe a brass/bronze coloration there?) and the yellow areas as maybe more lava/fire/burning? As well continue the red blood stains onto the hands. This cause...just wow the two on the outside are impressive...I am not sure of the process here though, likely a red base, then drybrush on oranges, yellows and whites? It looks super cool though so it is a contender. Spooky Scary Skeletons, Spooky Scary Skeletons . 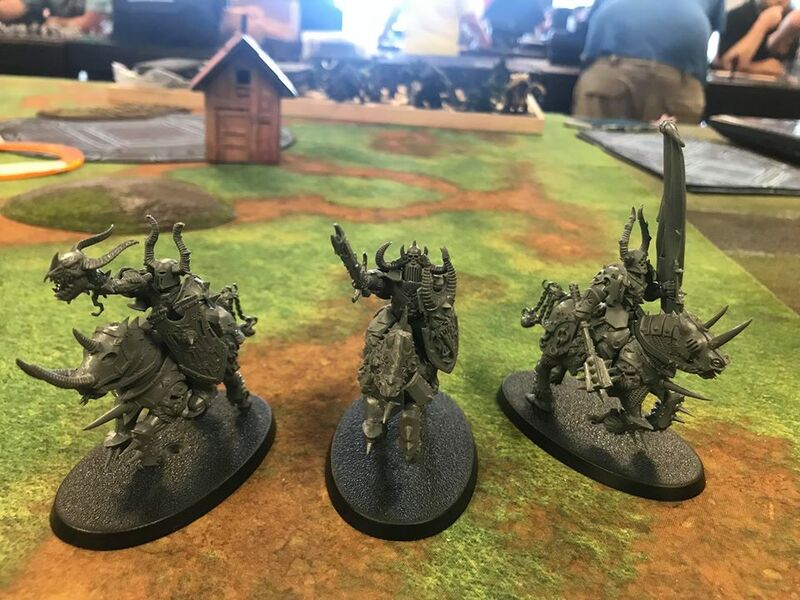 . .
Giga-Bites Cafe is hosting a building/painting challenge for Age of Sigmar. We were randomly assigned a starter kit, and I was fortunate enough to get the Malignants, a faction of the vengeful dead. Tormented spirits, scythe-wielding riders, and ghostly engines of war and bone sweep across the land leaving naught but withered husks and corpses in their wake. I’ve been wanting to pick some of these models up for a while as I’ve been wanting some spectral foes for D&D and the like, and Games Workshops models put many of the WotC models to shame. These will be the first Games Workshop models I’ll have ever assembled, and can’t wait to jump in. When David told me my faction, I could not contain myself... more than usual..
I’m starting out with the, well, Starter Box. It comes with: 3 Spoopy Ghost Bois (Nighthaunts), 5 Spoopy Farmers/Spoopy Ironclads (Hexwraiths/Black Knights), and a Three Spoopy Five Me Chariot (Mortis Engine/Coven Throne). What have I gotten into... 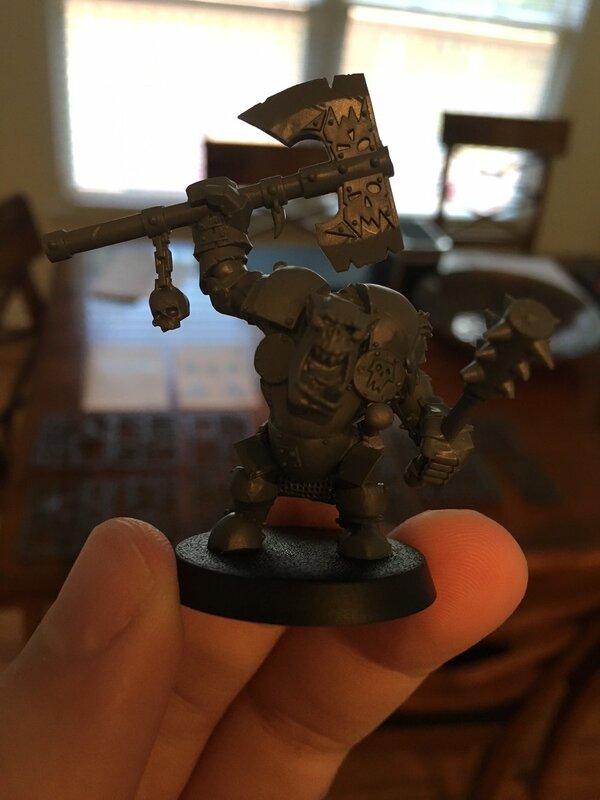 This will be my first time clipping out miniatures. Gods keep my hands steady, and please don’t let me accidentally throw any pieces away. Okay... So, I started in on the Nighthaunts, and they are GORGEOUS. I was surprised actually how smoothly they came together. They are beautifully intertwined and look great. I’m still unsure what colors I want to paint them (maybe a lavender/turquoise combo? ), but that will be a problem for another day. Stay tuned for more updates.